ZHANG Bo, HAN Wenqing, LI Ying, YANG Ge, ZHAO Lei, DU Xin, JIANG Yaqiu. Temporal Changes in Serum Levels of FT3, FT4, TT4, and TSH and Expression of Pituitary TSHβ mRNA in Rats after Hypoglycemic Stress[J]. Journal of China Medical University, 2018, 47(12): 1063-1066. Abstract: Objective To investigate changes in the serum levels of free triiodothyronine (FT3), free thyroxin (FT4), total thyroxine (TT4), thyroid-stimulating hormone (TSH), and the mRNA and protein levels of thyroid-stimulating hormone β subunit (TSHβ) in rats after hypoglycemic stress. Methods Thirty-seven male Sprague Dawley rats aged 8 weeks were randomly divided into five groups (0, 15, 30, 60, and 90 min groups) depending on the duration of persistent hypoglycemic stress. The rat model of hypoglycemia was established by the hypoglycemic clamp technique. Serum levels of FT3, FT4, TT4, and TSH were determined by immunosorbent assays. Real-time PCR and western blotting were used to detect the mRNA and protein expression levels of TSHβ, respectively. Results After hypoglycemic stress, serum levels of FT3, FT4, and TT4, and the mRNA and protein expressions of TSHβ in the pituitary gland all increased significantly in the 15 min group (P < 0.05). 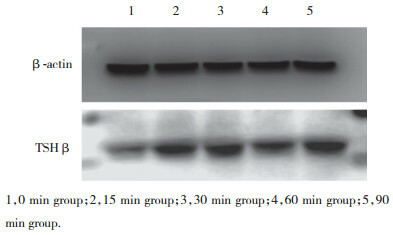 The serum level of FT3 and the expression of TSHβ protein decreased in the 60 min group (P < 0.05), while the serum level of TSH increased (P < 0.05). The serum levels of FT4 and TT4 decreased significantly in the 90 min group (P < 0.05). Conclusion Upon hypoglycemic stress, the serum levels of FT3, FT4, TT4, and TSH, and the pituitary mRNA and protein expression of TSHβ in rats first increased and then decreased. 1）P < 0.05 vs 0 min group；2）P < 0.05 vs 15 min group；3）P < 0.05 vs 30 min group；4）P < 0.05 vs 60 min group. ROVENSKY J, IMRICH R, MALIS F, et al. Prolactin and growth hormone responses to hypoglycemia in patients with rheumatoid arthritis and ankylosing spondylitis[J]. J Rheumatol, 2004, 31(12): 2418-2421. SPRAGUE JE, ARBELÁEZ AM. Glucose counterregulatory responses to hypoglycemia[J]. Pediatr Endocrinol Rev, 2011, 9(1): 474-475.